When you optimize a website for large keyword sets, extracting the SEO value out of tens of metrics and explaining the benefits to your clients can prove to be difficult. This is where the reporting system in AWR Cloud comes in handy. Our latest update focuses almost entirely on improving reports, giving you better control over charts and data refining. You can now select the specific evolution in time charts that will be included in your PDF and HTML reports. This is easily achieved by editing the reports you are interested in, from the Reports -> Edit Reports menu. 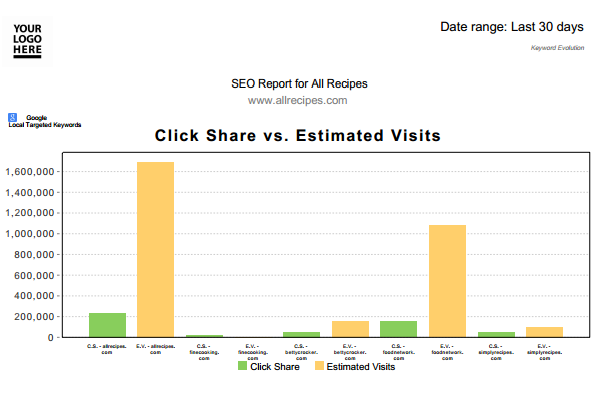 Here, you can choose from four comprehensive charts that display rankings or Google Webmaster Tools data. You can see how each chart will look like in your report by hovering with the mouse over the info icons. 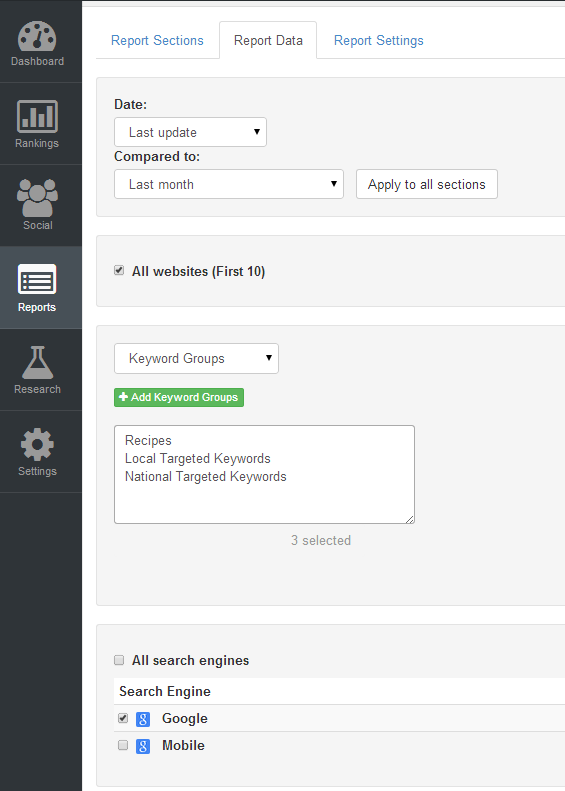 If you are managing your keywords by groups, you can also organize the data from the Keyword Evolution charts by groups and search engines. When this option is selected, the report will also include separate charts for each keyword group & search engine combination available in your AWR Cloud project, or only those you have selected in the Report Data tab. 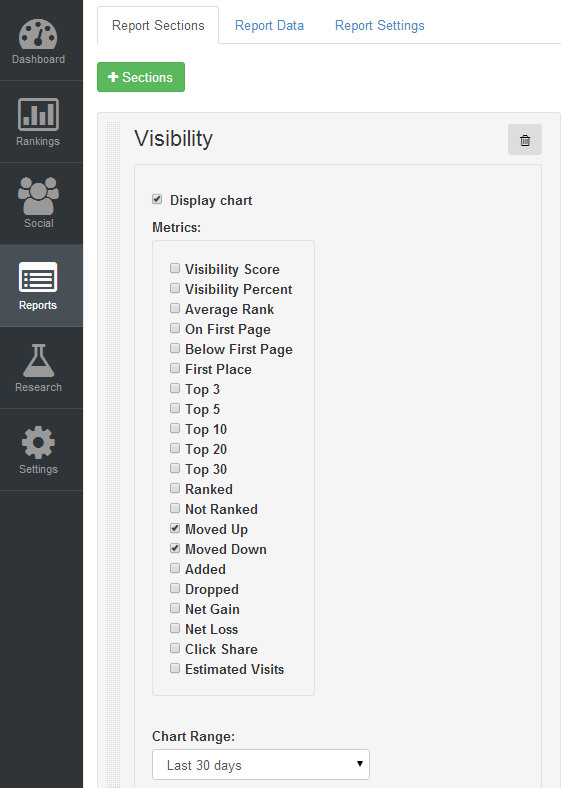 Following our latest improvements, you have the possibility to include in the Visibility section of the reports only the search ranking metrics that matter most to you and your clients. 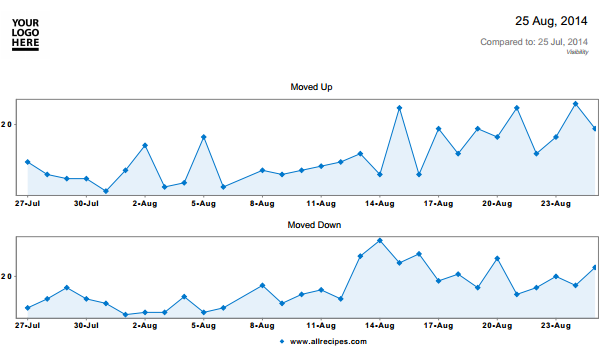 For example, if you want to show your client the evolution of keyword rankings that moved up compared to those that moved down during the last month, you can select only these two metrics in the report editor and set the chart rage to cover the last 30 days. 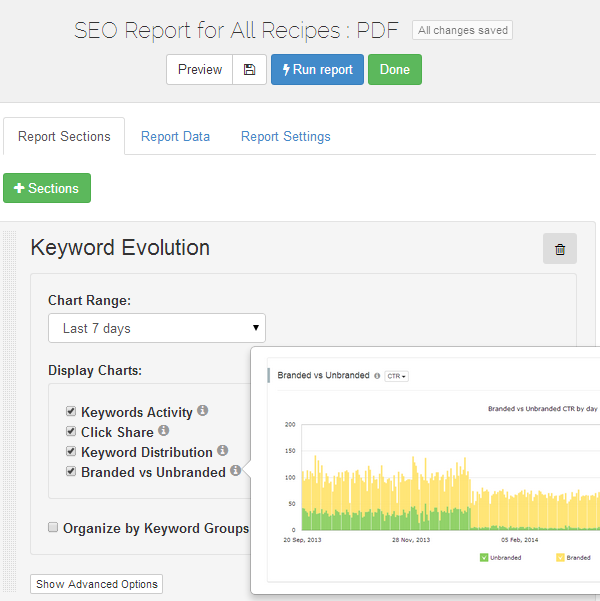 We increased to 10 the number of columns that you can display side by side in the PDF reports. 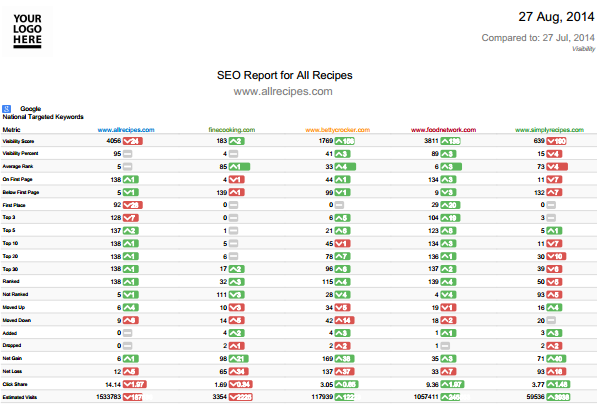 To see how it looks like, just create a new PDF report from Reports -> Edit Reports and select the Landscape orientation. 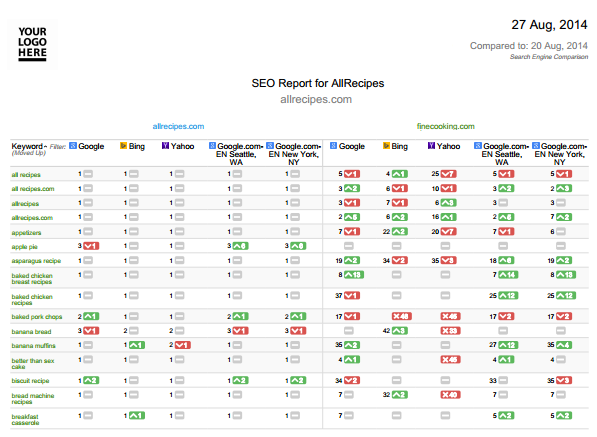 This enhancement is available for the Search Engine Comparison and Website Comparison report sections. 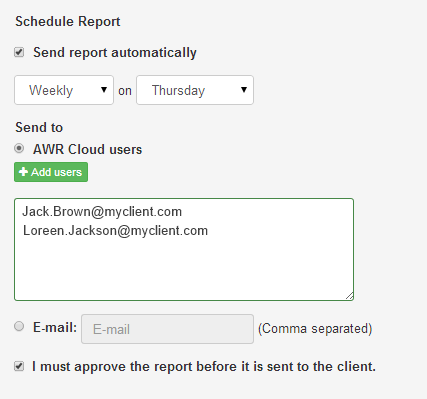 Now you can send a scheduled report to multiple clients added as users in AWR Cloud. Just add their emails from the Report Settings tab, and all of them will receive the report automatically on the selected frequency. You can now tag or delete multiple projects at once straight from the Websites screen. To do this, just select the projects you are interested in, click on the Manage Websites button that enables you to choose one of the available actions: Add tag or Delete websites. This new update introduces the Added on column, which shows you the date when you started to monitor each keyword and search engine in your project. The column is available in the Keywords and Search Engines screens from the Settings -> Website Settings menu. You can now prevent specific team members in your AWR Cloud account from managing the keywords and search engines in the projects assigned to them, and thus from increasing your resources usage. This is achieved by using the disallow resources handling action in the Users screen. That’s about it for now. I hope the new report customization options and project management improvements take us one step closer to making your life easier! Feel free to share your thoughts about AWR Cloud in the comments section below. If you haven’t tried it yet, Sign up for a 30 day Free Trial and tell us what you think. When will there be an ability to search between custom dates throughout the tool? Nice work guys – Really happy and impressed with your constant evolution and forward thinking about what we (as clients) need from your service. First of all, we’re happy that you, guys, like our new improvements. Thanks for the positive feedback. @Envision Online please send us a quick email at help@awrcloud.com with more details about your request, and our support team will get back to you shortly.